Chefs can maximise the potential of meat on the menu while still catering for customers looking to reduce their consumption, says hospitality fresh produce specialist Bidfresh. The business is launching a new national brand for its premium meat range, Countrywide Butchers, and is using National Butchers Week, which runs from 11-17 March, to spotlight the wide range of meat and added value services available to chefs. The new brand brings together products and expertise from the four regional specialist butchers within the group – Campbell Brothers, Henson Meats, Knight Meats and Williams of Flint – to supply national accounts. These businesses already work with over 2500 chefs in hotels, restaurants, pubs and other catering business across the UK. As well as the hospitality industry’s widest choice of sustainably-sourced meat and game, services also include preparation by specialist butchers to customer specifications, along with cooking information, menu consultancy and a range of additional support. Laurence Tottingham, Development Chef for Oliver Kay Produce, sister company of Countrywide Butchers and part of the Bidfresh group, says, “The trend towards consumers eating less meat, especially amongst the younger demographic, has been well publicised and we know from conversations with our customers that many chefs in hotels, restaurants and pubs are looking at ways to address this issue. “We’re using National Butchers Week and the launch of the Countrywide Butchers brand to help our customers focus on the positives. 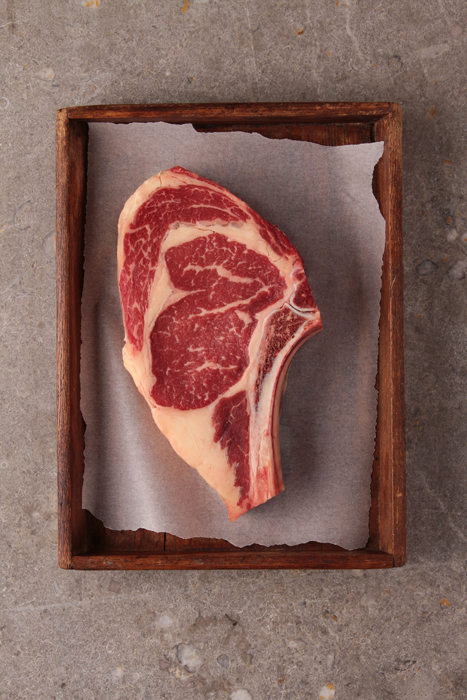 For consumers taking a ‘flexitarian’ approach to their diet, meat becomes more of a treat, and so we can help chefs emphasise the premium quality of the meat on their menu. • Cuts pre-prepared by specialist butchers add value for customers, minimise food waste, and add profit to meat dishes. 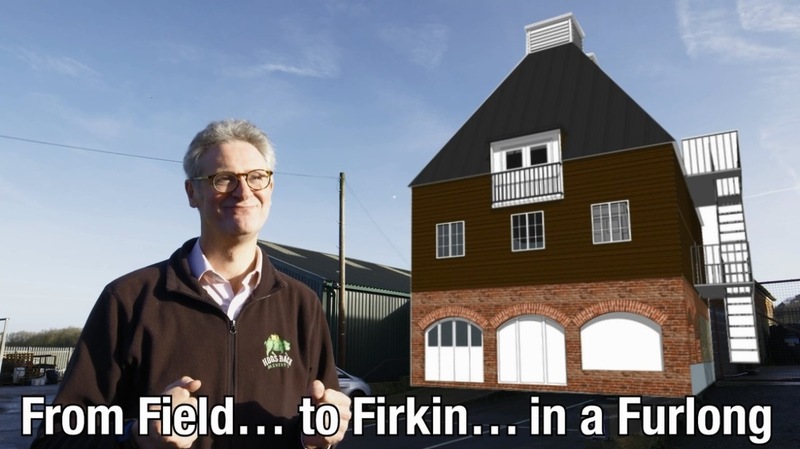 Hogs Back Brewery is building a new hop kiln on the brewery site at Manor Farm in Tongham, Surrey as the brewery continues its significant investment programme. This large-scale project is believed to be the first traditional style kiln to be constructed in the county for over 100 years. It will cost £350,000 to complete, taking total investment in the brewery and hop garden over the last 12 months to £700,000. The kiln, which will be operational ahead of Hogs Back’s harvest in September, is being built just yards from their brewhouse and their new, much larger hop garden. It will stand on the site occupied for many years by an original kiln within Manor Farm and will be used to dry Hogs Back’s hops for around one month a year. For the rest of the year, it will serve as an event space and visitor centre, educating people about the local hop farming industry which Hogs Back is helping to revive. Siting the kiln so close to the hop garden and picking machine means hops can be dried immediately after picking. Hogs Back is also investing in state-of-the-art vacuum packing technology to capture the hops’ freshness, with the aim of having them packed within 24 hours of picking. Once packed, hops will be stored in optimum conditions in a new warehouse, to be housed in a converted barn on the farm. Hogs Back Brewery managing director Rupert Thompson said, “A £700,000 investment, at a time of some uncertainty in the beer market, speaks volumes for our long-term commitment to brewing in Surrey. Hogs Back’s new hop garden occupies 8.5 acres of prime farmland on Manor Farm, and work started last autumn to prepare it for the 2019 growing season, with anchors, posts and several miles of hop wire now in place. 2,000 hop plants were lifted from the old garden and a further 4,000 new ones planted. Three varieties are being grown on the new site: Fuggles, Cascade and Farnham White Bine. Thompson said, “We are excited about continuing the journey we started with the planting of our original hop garden in 2014, and, through the new visitor centre, sharing our passion for hop growing with the wider community. 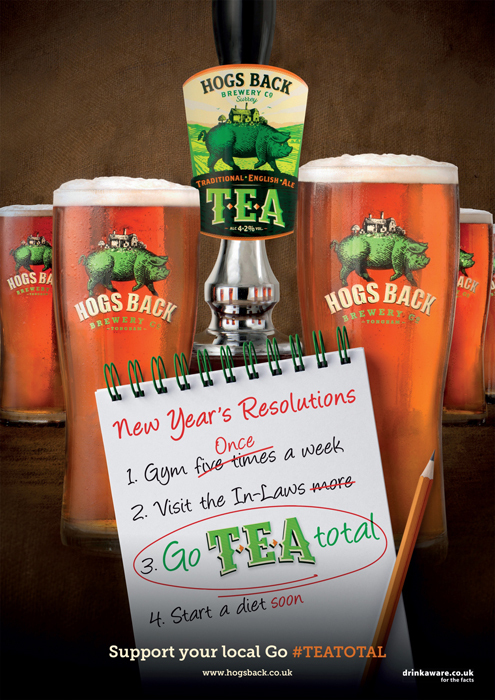 Hogs Back Brewery is encouraging consumers to kick off 2019 by going ‘TEA Total’ and enjoying a pint of its flagship beer TEA (Traditional English Ale) in their local pub during January. The ‘Support Your Local – Go TEA Total’ message will appear on pump clips and posters in pubs as well as on social media. The campaign reminds people that pubs are a great place to meet friends and enjoy a locally brewed beer all year round. Rupert Thompson, managing director of Surrey-based Hogs Back Brewery, said, “Our TEA Total campaign is a little tongue-in-cheek, but also has a serious message behind it. Pubs are an important part of the community, and they particularly need support during January, which has always been a quiet month for the trade and become even quieter since the arrival of Dry January. A specially brewed seasonal ale, Rye January, is also available from Hogs Back. At 3.8% ABV, it’s a red rye beer with spicy and hoppy notes. It will be stocked in a number of pubs across Hogs Back’s Surrey heartlands. Alcohol education charity Drinkaware and retail giant ASDA are teaming up again in 2019 for a partnership that will see Drinkaware ambassadors going into 100 stores across the UK on 11th and 18th January to give shoppers information and advice about alcohol. This will be the third year of the initiative, which last year saw in-store Drinkaware ambassadors engage with almost 7,000 Asda customers. This year, the Drinkaware ambassadors will be giving out printed literature and encouraging customers to record their drinking levels; in 50 stores, customers will use a scratchcard while in the other 50, ambassadors will help them to fill in the online Drinkaware DrinkCompare Calculator, which will analyse their current drinking and compare it to others in the same age group. Drinkaware has also trained Asda community champions, as a way of taking the messages about drinking in moderation out to the wider community through their work with local groups. Rommel Moseley, Drinkaware Director of Business Development & Partnerships, said, “Working together with ASDA for the past three years has enabled Drinkaware to get out into their stores across the country and work with people face-to-face. Chris Lowe, Senior Director for Corporate Affairs at Asda, said: “We are pleased to be working with Drinkaware again this year, as part of our role as a responsible retailer, helping them to engage directly with our customers. 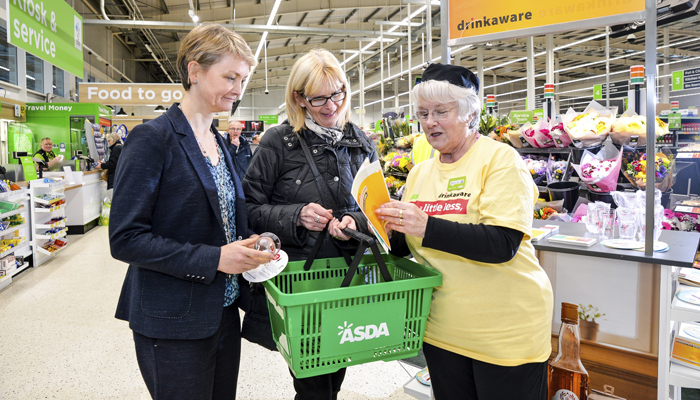 Caption: the Drinkaware Ambassador at Asda’s store in Glasshoughton, West Yorkshire, in January 2018, with a customer and local MP Yvette Cooper, one of many MPs who visited their local store to see the Drinkaware activity. MPs are being invited to engage with the campaign again this year. Hospitality greengrocer Oliver Kay Produce is helping its customers to reduce waste with a new sustainability initiative making 80% of its packaging recyclable. The business, which supplies fresh fruit and veg to more than 3,500 chefs around the UK, is also converting waste produce from its warehouses into compost. 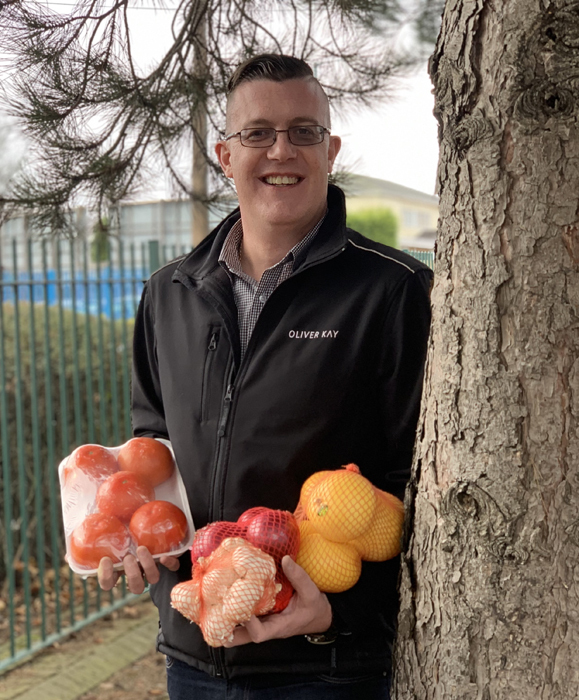 Oliver Kay has become the first catering greengrocer to replace polystyrene trays used to deliver produce with compostable trays made from sugarcane, and plastic nets for fruit with compostable netting made from beechwood. It has also introduced 100% recyclable plastic wrap for its deliveries. The business, part of the Bidfresh group, has installed an automatic screw press process in its Bolton warehouse, which removes the water from fruit and vegetable waste to reduce the density of the load by 90%, leaving only organic waste behind. The resulting compost can be collected by farmers delivering goods to Oliver Kay, to use on the fields growing the veg. In addition to the larger projects in the warehouse, paper and plastic waste used in offices is being separated and recycled, while re-useable drinks containers for staff have removed the need for plastic water bottles. In addition, some surplus produce is donated to local charities and organisations. The next step will be to upgrade the biodegradable plastic bags used to deliver produce such as peppers and spring cabbage, to a fully compostable or recyclable option. Stephen Oswald CEO of Bidfresh, said, “Paul’s enthusiasm and drive to get this project in place has been an example to all in our business and the wider foodservice community. We will be taking his example and rolling it out across the rest of our organisation. We must ensure that all our packaging is compostable in the future”. Hogs Back Brewery is encouraging beer lovers to give both themselves and their local brewer a Christmas bonus by enjoying locally brewed beers across the festive season. The brewery, based in Tongham, Surrey, has decked the halls and rolled out the barrel as it prepares to welcome both year-round and once-a-year regulars to the Brewery Shop. Rupert Thompson, managing director of Hogs Back Brewery, said, “Just as people who shop at the supermarket all year round will buy their Christmas turkey from the local Farm Shop or Farmer Market, we also a see an upturn in customers supporting their local brewer during the festive season. “Thanks to our hop garden, which we’re almost tripling in size, we’re very much a part of the local farming community. Beer is an artisan product made from natural ingredients, and an essential part of the Christmas tradition in Britain. “The festive break will be a long haul this year, with many people celebrating from the weekend before Christmas right through to the New Year, and we certainly think there’s scope to ring the changes and swap a bottle of plonk for beers matched to festive fare on some occasions across the holiday. • Festive buffet with Outback Pale Ale (4.5% ABV): The refreshing light and hoppy flavours make Outback a great drink to serve with sausage rolls, creamy vol-au-vents, pork pies and other buffet food. At its most popular time of year for visitors, Hogs Back is offering additional brewery tours in December, while Christmas Eve will feature carols with the Friary Brass Band from 11.30am – 1pm, with mince pies for all. With extended opening hours in the run up to Christmas, the Brewery Shop is a great one stop shop for festive beer, with knowledgeable staff on hand to offer advice, and free parking outside. See the website www.hogsback.co.uk for details and opening hours. 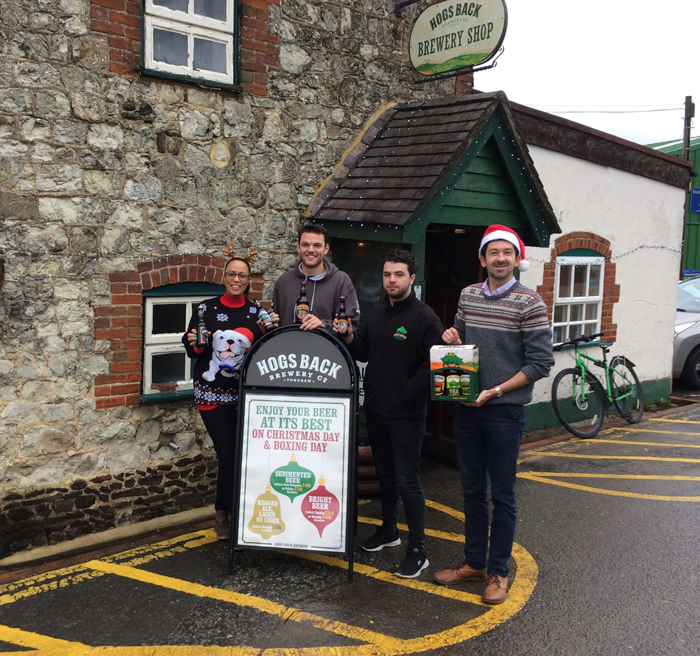 Caption to attached image: The Hogs Back Brewery team ready to welcome customers to the brewery this Christmas. Pictured left to right are Donna Wilson, Joel Swan, Kane McAdoo and Jonathon Mileman.